Long has it been said that "cops and the Klan work hand in hand." 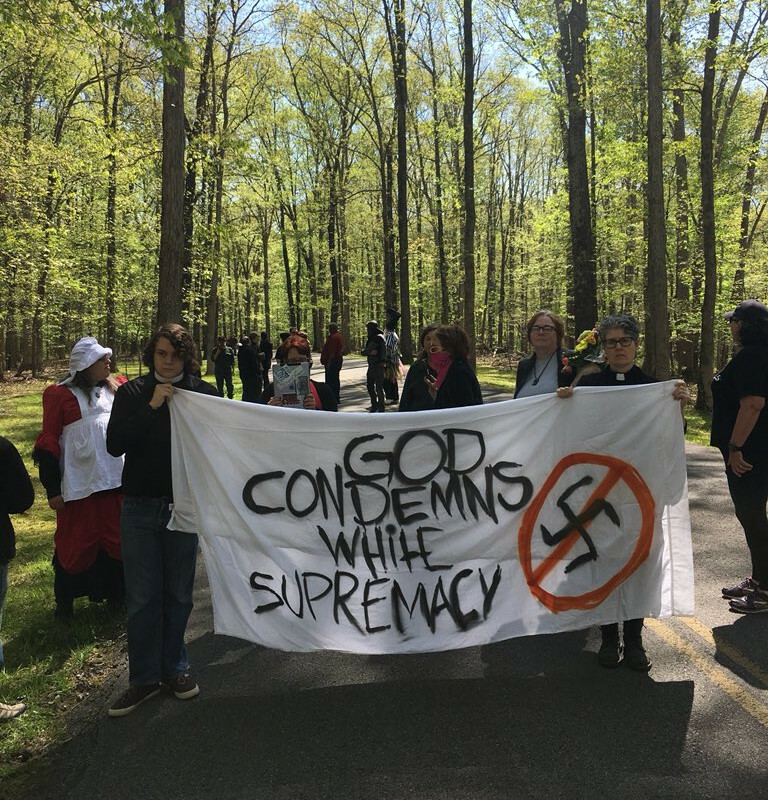 On Apr 28, police used all available strength to defend an alt-right even for the second week in a row. The American Renaissance Conference (driven out of DC in 2010) met that day in Montgomery Bell State Park in TN. Protesters had the choice of staying out of sight and sound or marching into a protest pen where all entrants were searched. On the 26th of April the Court of Appeals overturned zoning approval for the "Planned Unit Development" that had been planned to replace and evict Barry Farms. 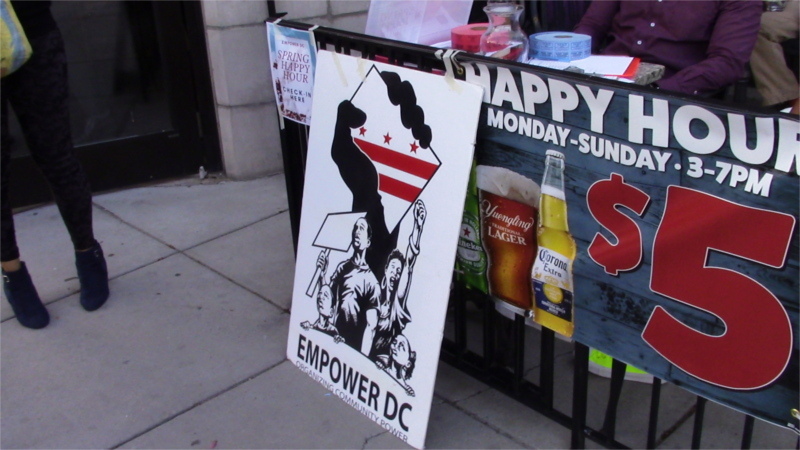 While this fight probably isn't over, Empower DC turned their already scheduled happy hour at Mediterranian Spot on U st into victory party. The Shortwave Report 04/27/18 Listen Globally! Read more about The Shortwave Report 04/27/18 Listen Globally! On the 25th of April, the US Supreme Court heard oral arguments in Trump's Muslim Ban case as protesters gathered outside. A Japanese-American speaker warned of the ugly precent set by the 1944 Supreme Court Korematsu_v._United_States case. In that case, the Supreme Court upheld the wholesale mass incarceration of Japanese-Americans during WWII. If the Supreme court overturns the Muslim Ban, Trump will suffer s serious strategic defeat, the loss of a core campaign promise. 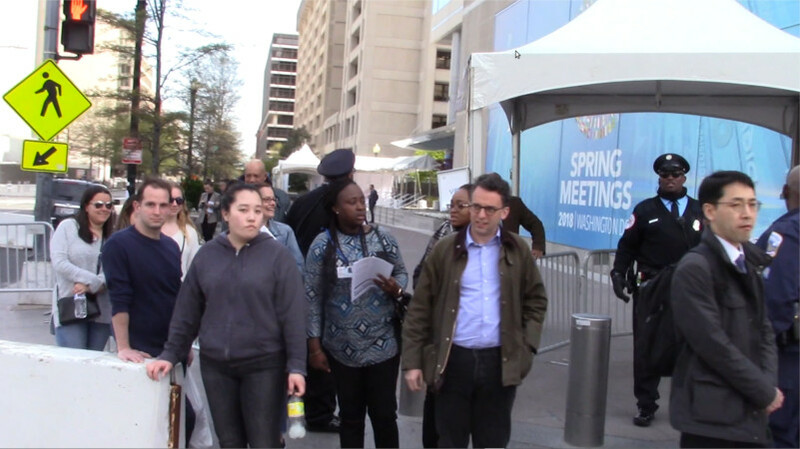 Officials from governments, the IMF, World Bank, the private sector and NGOs meet this week at the United Nations for the Financing for Development (FFD) Forum. The annual gathering seeks to implement the Addis Ababa Action Agenda that governments endorsed in 2015 in Ethiopia. "These meetings are critical to address the root causes of poverty and raise revenue in the developing world," said Jubilee USA Executive Director Eric LeCompte. LeCompte has participated in FFD negotiations since 2012. 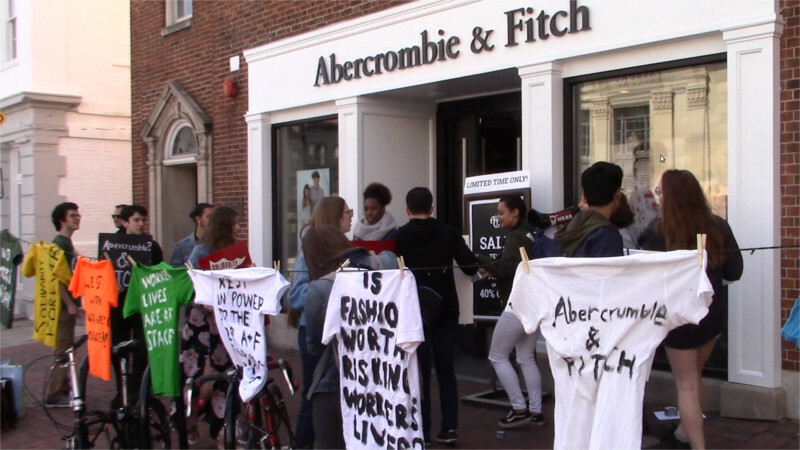 On the 21st of October, Students Against Sweatshops picketed the Georgetown outlet of Abercrombie and Fitch. The sweatshop-friendly retailer was renamed "Abercrumble and Ditch" for their decision to refuse to sign the 2018 follow-on to the post Rana Plaza "Accord on Fire and Building Safety." Worse yet, some of the protesters reported the retailer is still using one or more suppliers who were involved in the Rana Plaza collapse that killed almost 1,200 workers back in 2013. Read more about Students Against Sweatshops pickets "Abercrumble and Ditch"
Dear Radio Friend, This week's show features stories from Radio Havana Cuba, Sputnik Radio, and NHK World Radio Japan. From CUBA- Argentine activist and Nobel laureate Adolfo Perez Esquivel has led a campaign to nominate imprisoned former Brazilian President Lula da Silva for the Peace Prize. The Mexican government has announced it is increasing the number of federal police currently guarding Mexico's southern border to prevent the flow undocumented immigrants from Central America. Read more about The Shortwave Report 04/20/18 Listen Globally! 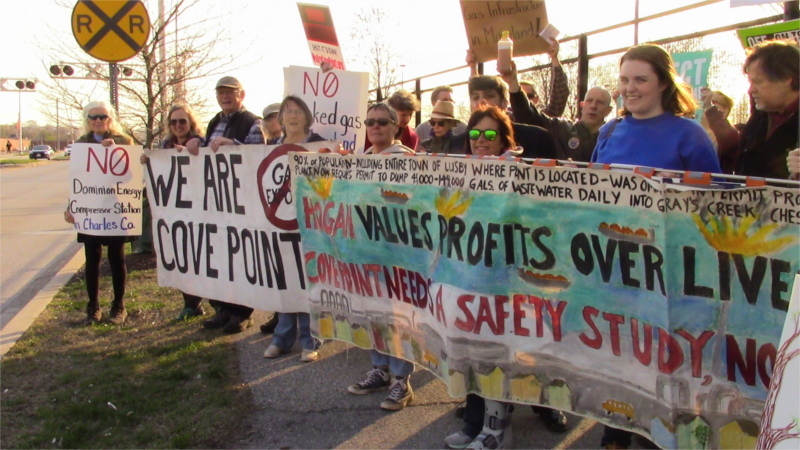 On the 18th of April, MD residents from Cove Point, Accokeek, Myersville, and other places menaced by fracked gas project protested outside the MD Dept of the Environment. 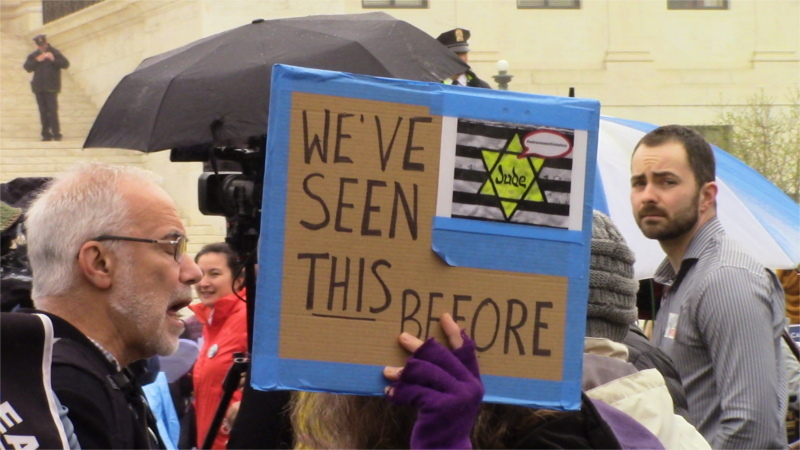 They were there to demand that the existing state ban on fracking be made meaninful with a ban on fracked gas pipelines and compressor stations, and that the export terminal at Cove Point be shut down. 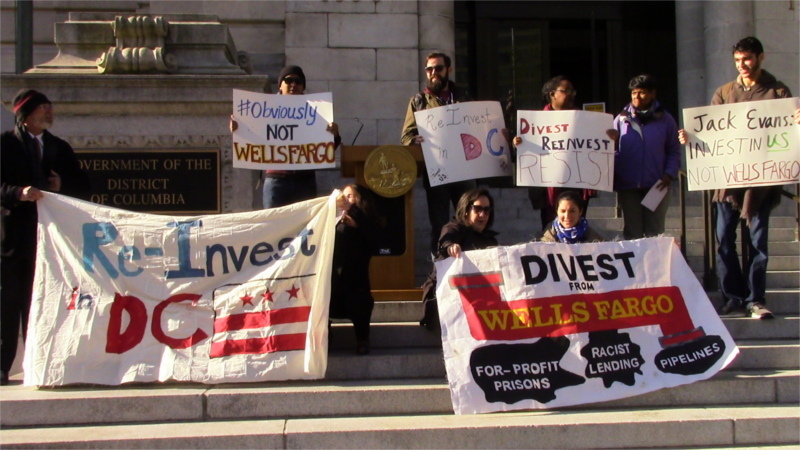 On the 18th of April, DC Divest rallied on the steps of the Wilson Building, then packed the room at the DC Council’s CFO Oversight Hearing. 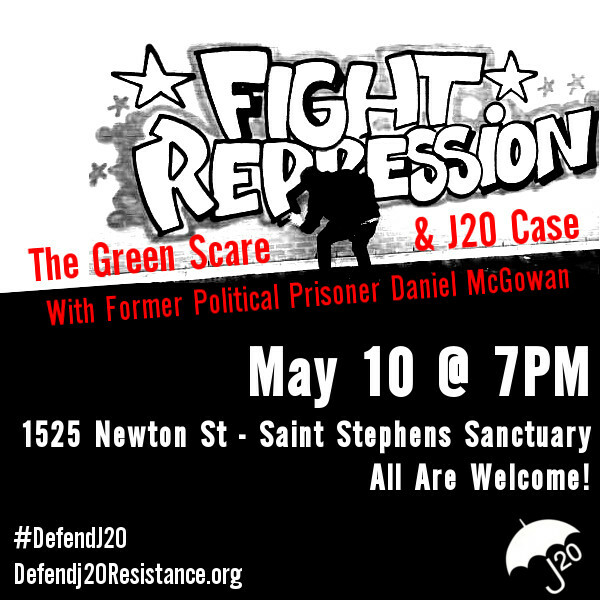 They were there to demand that Jack Evans stop holding up a bill to remove the DC government's money from Well Fargo. 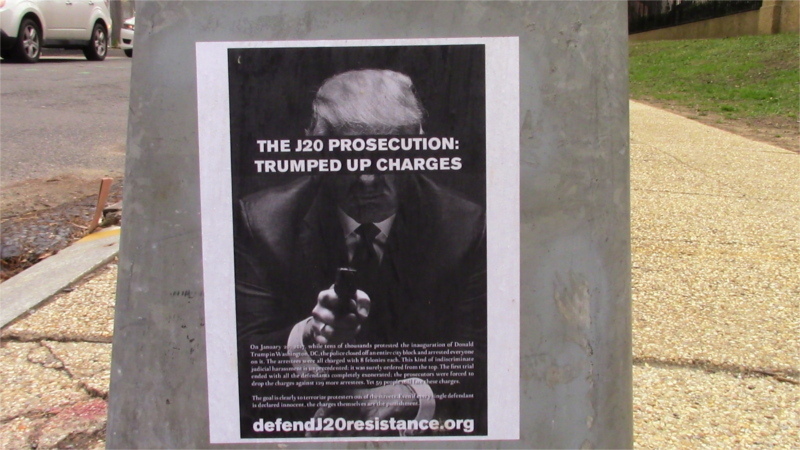 Another round of solidarity posters for the J20 defendents has appeared around DC, this time showing Donald Trump aiming a pistol at the viewer and warning of literal Trumped-up charges. In other words, it is believed that the decision to file such questionable cases that the first six defendents were acquitted and later trials have been delayed goes right to the top.